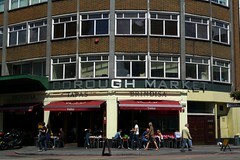 A lively and busy tapas bar alongside Borough Market, just near London Bridge Station. By occupying a corner location where Southwark Street and Borough High Street intersect, this tapas bar ensures itself plenty of custom. Even on a Thursday when the kitchen wasn't at full strength (there was a problem meaning that most of the hot tapas dishes were unavailable), the place was still thronged at 12:30pm. However, on another visit on a sunny Saturday lunchtime, it was still possible to get a seat. In general, although you may need to wait a little while at peak times, there is plenty of turnover of tables (the website mentions a two hour maximum stay). The menu covers meats, cheeses, fish and a small selection of vegetarian-friendly dishes and sides, as well as salads and desserts (there's a separate wine list) photo of menu in June 2009. Draught Cruzcampo lager is also available. None of the tables are particularly large, which can be a problem if you're ordering a lot of dishes (for which reason they tend to avoid bringing them out all at once), but the seating-height ones down the back near the kitchen turned out to be rather hot during summer. On Ewan's June 2009 visit, a plate of chorizo iberico (£5) photo was well stocked for the price (though there are infinitely pricier meat options available). The chorizo came at the same time as our selection board of Spanish cheeses (£13.50) photo, which may have seemed a comparatively mean selection if not for the fact that they were all excellent (especially the creamy blue-veined goat's cheese), and served with complementary flavours (some salsa, quince jelly, fig, and grapes). As these were cleared, a spinach omelette (£4.50) photo arrived, which was perfectly decent, as well as salted anchovies on toasted garlic bread (£5.95) photo, loaded down with roasted vegetables as well, and a beetroot salad with Picos blue cheese (£5.35) photo, also excellent. For dessert, a chocolate sponge (£5) photo was particularly fine, very light and a little dry, but balanced in that regard by the sherry topping and the simple ice cream. My friend had the crema catalana (like crème brûlée, £4), which came very attractively presented in a weighty iron cooking vessel photo. On a return visit in May 2012, the chorizo plate was still excellent, while a braised ox tail (£8.75) photo took a little work to get off the bone but was tasty and served with crispy potato chips. The highlight, though, was another dish only available at this branch of Brindisa, the black rice with squid and aioli (£6.50) photo, which was hearty and wonderfully flavoured. Prices of the other dishes and the quality of the food remain little changed from those listed above on a 2009 visit. Service was rushed but not hard to attract the attention of, and erred on the side of perfunctory yet perfectly agreeable. Note that hot plates are only available noon-3pm and 5:30pm-11pm daily, and breakfast rather than tapas is served from 9am-11am on Friday and Saturday (Market days). Last visited by Ewan and Kerry, May 2012. Opening hours taken from menu, June 2009, and differ slightly from those listed on the website. Last edited 2017-09-18 19:39:50 (version 13; diff). List all versions. Page last edited 2017-09-18 19:39:50 (version 13).